So I thought I’d turn the world on its head for a moment here and write about that very topic. If you’ve been jamming with us here at The Dad Jam lately, you’ll know that we are going diaper free with our daughter, who is now 18 months old. With her, we never had to ask ourselves if she was ready… we only had to ask ourselves if we were ready. The same principle can be applied to potty training any toddler, whether you have gone diaper free, used cloth diapers, or used disposable diapers. An important consideration you have to make is if you are ready or not – because this will, in large part, determine your probability of success. For example, when potty training, one tip that is often thrown around is to put your child on the potty when she wakes up first thing in the morning. I have met parents that have said they didn’t want to do this because they still like to lie in bed in the morning and don’t want to make the effort. If such parents were more ready for potty training, they’d have have better success, and would have their child potty trained sooner. Even after a child has been potty trained, there are still times when accidents happen, or they are in a public place and their child has to pee and there is no bathroom in sight, or their child wakes up in the middle of the night and needs help going to the bathroom. 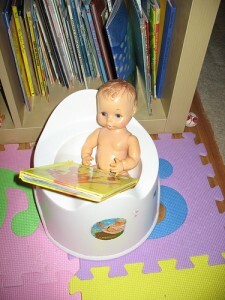 If you are not ready for these situations, then you are not ready for potty training. Prepare for accidents and possibly some stains. Get over it, it happens. Prepare to bring an extra set of clothes with you when going out in case of accidents when you are out. Again, it happens, get over it. We also found, with a boy, bringing a bottle he can do number 1 in helps if you are stranded somewhere without a toilet and he really needs to go. With our daughter, we bring a little potty with us. Don’t be grossed out by it. It’s your child after all, and it’s natural. Don’t stress out your child, have a positive attitude toward the whole experience. Prepare to get up in the morning and put your child on the potty. Be prepared to interrupt what you are doing to put your child on the potty when you notice signs that she has to go. This works best if you have motivation. If your child is wearing a diaper, there is not a lot of motivation… if he is NOT wearing a diaper on the other hand, you’ll be there faster than you can say, “carpet stain.” In other words, buy some undies, preferably not white ones. Prepare to teach your child and foster your child through this experience. Prepare to be consistent. If you notice your child has to go, and especially if he tells you he has to go, don’t let him go in the diaper just because it is easier or you don’t want to make the effort to pull out the potty. Send a consistent message. Prepare to persevere through the difficult times. Sometimes children go through developmental phases that interfere with the potty training and you may feel like you’re taking two steps forward and one step back. Prepare for these times and stay positive. Everybody manages in the end! Be especially vigilant when the kids are playing. This is a time when they may be so wrapped up in what they are doing and having fun that they either forget that to say they have to go, don’t realize they have to go, or don’t want to say they have to go because they don’t want to break away from the fun they’re having. Keep in mind that if your child is over 18 months old, he is probably already ready. In the “diaper free” jam that I wrote here, I mentioned that not so long ago, most children were potty trained by the age of 18 months. Nowadays, children are potty trained much later. Have the children changed? No. What has changed is our lifestyles, what the media tells us about potty training and keeping kids in diapers (so that the diaper companies can sell more diapers), our own attitudes towards “waiting for the child to be ready,” and of course, our own lack of readiness or willingness to take the plunge (and reduced need to take the plunge, thanks to size 5 or 6 diapers, care of Pampers). So if your child is over 18 months old, don’t worry too much about whether or not she is ready, unless you really think she is not. There are cases when a child may still not be ready by 18 months, so I don’t want to generalize or give advice about that. There are plenty of articles out there about child readiness, as I’ve said. Once you’ve got that all down, most importantly, think about whether or not you are ready, then get ready, and go for it! Please leave a comment below to let me know what you think, or to share your own experiences. LOVE IT! Thank you for this gentle, cool-headed reminder. Time-outs have turned into a meaningless punishment in our house. We need a better plan. I hate the self-help books so this really sums it up. Thanks Elizabeth, I guess you meant for that comment to be on the “Alternatives to Time-Out” article I also found that “How to talk so Kids will listen and listen so Kids will talk” is another good source of inspiration on this topic. We used to use time-outs and found, like you said, that they turned into a meaningless punishment. Now we find we don’t need them anymore and these alternatives, as well as just changing the way you talk and react, really helps. Good read, just because the child is ready doesn’t mean the parents are. Need both parties to be on board! Thanks Chris, I definitely agree! Omg. Thank you so much this article on potty training was very helpful. I have 3 children under 3 i have twin boys that r 2 and a daughter that is 9 months and we’re in the process of potty training our twins and these steps really are helping me. Thanks alot!!!!! Hi Jessica, thanks for your comment, that is great to hear!! Wow, you really have your hands full! Glad this was helpful!